Continue reading to learn about all these great features and make sure to register for the 2017 Microsoft Data Insights Summit to see all the new and exciting Power BI features in person! In our continuing quest to add more slicer types, this month we are previewing a relative date slicer, which lets you filter based on the last 1 or more years, months, weeks, or days. This makes date slicers much more powerful, as you can always filter your report to the latest data. You can choose the Relative option from the list of available date slicer types. 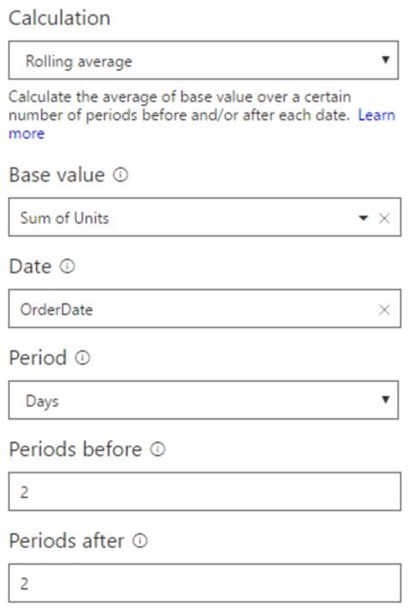 If you pick an option marked with (Calendar), the filter will be based on calendar periods. For example, if you filter to 3 years, data from the last 3 years from today’s date will show. If you filter 3 years (Calendar), data from the last 3 completed calendar years will show. We show the dates used for filtering under the slicer, so you always know what data you are looking at. You can also switch to filter to this period or the next period. This is useful if your data hasn’t refreshed today and you don’t want to include data from incomplete days. We’re planning to incorporate this relative date approach into the Filter pane in a future update as well. 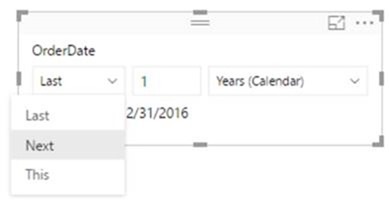 Turn on this feature through File > Options and settings > Options > Preview Features > Relative date slicer. We are very excited to release a preview of a new table, with many of the new features you love in the matrix preview. This new table, just like the matrix preview, is its own visual so you can test it out without needing to affect any production reports. You can turn this preview on using the same option as the matrix preview, File > Options and Settings > Options > Preview features > New table and matrix visuals. We’ve add many data label improvements to line and column charts over the last several months, and you can now take advantage of these changes in combo charts well. If you have one of these link types in your data, and mark the column’s data category as Web URL, we will open the application you picked when the link is clicked. For example, if you set Outlook as your mail client, Outlook will open a new email if you click on a mailto link. You can also use icons instead of the entire link in your tables by using the URL icon option in the Values card of the formatting pane. 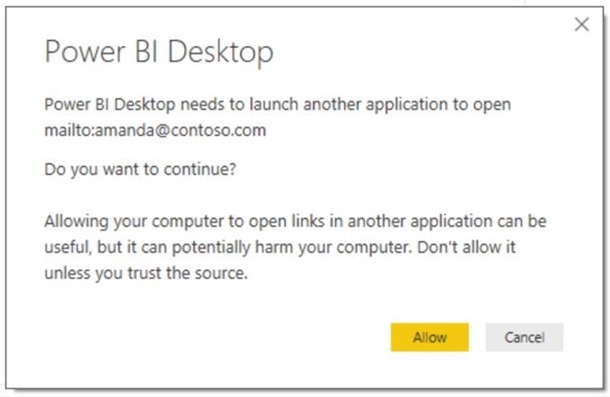 If you are using the Power BI service, the browser will handle opening the link. In the Desktop, we will prompt you with a message confirming you want to continuing launching another app. If you want to use file URLs, there are some limitations. 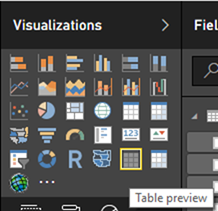 They will not open in the Power BI Desktop, only in web browsers. For most browsers, you will need to right click on the link, copy the link address, and paste the URL in a new tab. We’ve also added support for mailto links in textboxes. This is great if you want to give your report viewers a person or group they can contact if they have any questions. 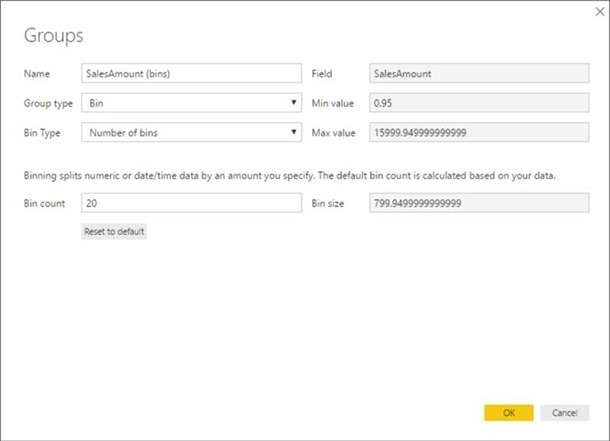 If you are creating a live connection to a tabular Analysis Services server or a Power BI service dataset, you can now create new measures using DAX. These measures will not be part of the model. However, they will behave just like measures defined in imported models, meaning you can set their data type and formatting, see error messages when you break the measure expression, and use intellisense when editing the expressions. 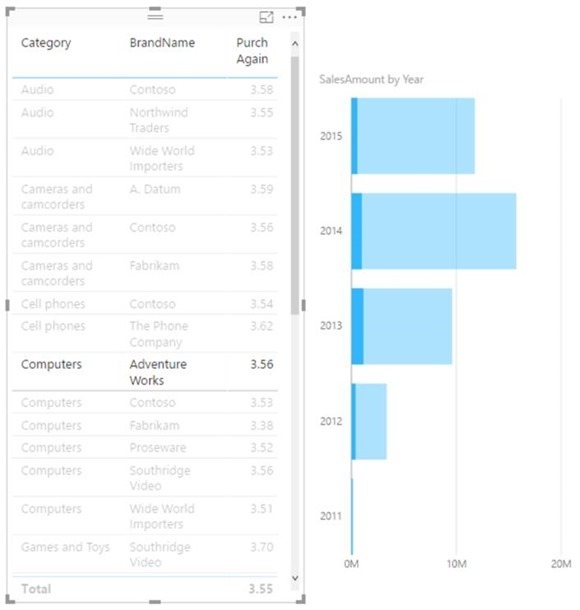 Also, they can be used in reports published to the Power BI service and used in visuals pinned to dashboards. You create them in just the same way as you would for an imported model, from the New Measure button in the ribbon, or by right clicking in the field list. 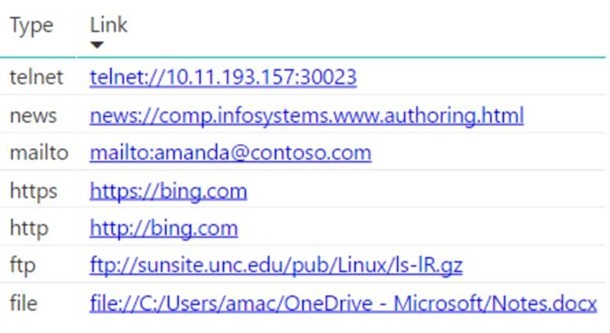 We currently only support report measures a live connection against Analysis Services Tabular models. You won’t be able to create measures when connected to Multidimensional cubes, but we’ll consider this for a future release based on your feedback. We’re building on last month’s release of quick measures with two new additional calculations: Total for category and Rolling average. Total for category will calculate a total across all the values in a category. 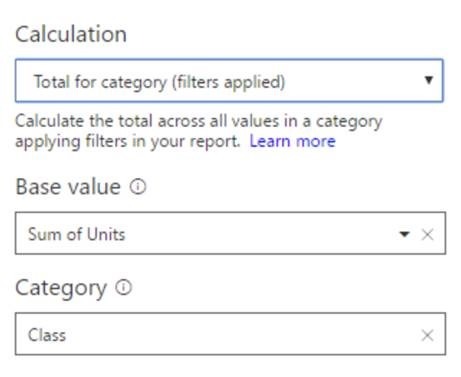 There are two options for Total for category, one that will respect filters applied in the report and one that will ignore the filters. Both can be found under the Totals section. These are useful building blocks for creating measures that calculate the contribution to a total amount or percentage of parent. Rolling average will perform an average of the measure chosen across the given number of periods. It can be found under the Time Intelligence section. We’ve also added made some general improvements to the quick measures feature. First, for some quick measures you can now pick if blanks should be treated as zeros or be blank in the calculation. This is important when visuals use an attribute where the measure doesn’t have a value. 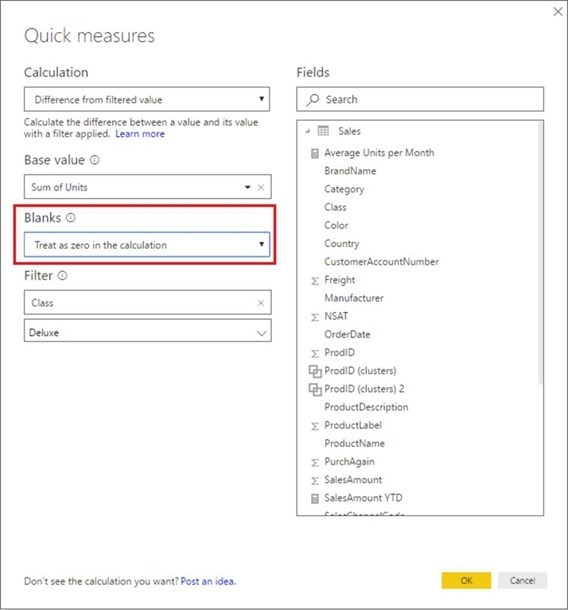 For example, if your date dimension extends further than the data, you might want your quick measure to return blanks when the base value is also blank. Second, quick measures will now match the formatting of the base measure if the chosen measure doesn’t need a specific formatting. For example, doing a year to date on a currency column will preserve the currency formatting from the base measure. This should save you some time when creating new measures. Where k is the suggested number of bins and n is the number of points (rows) in your data – we also make sure won’t have more bins than you have data points. 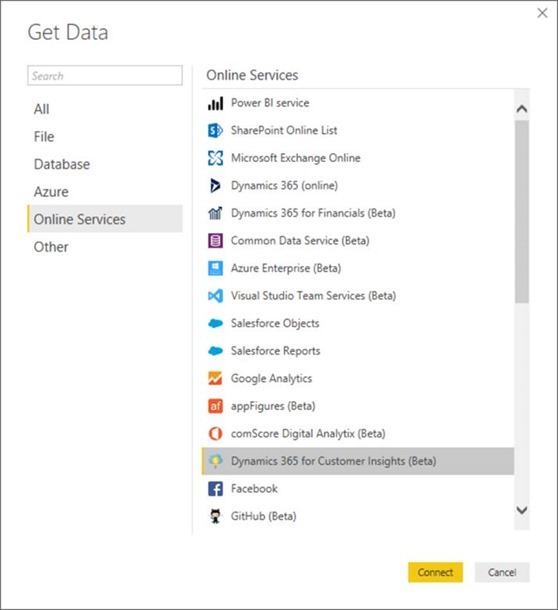 We’ve added a new connector that allows you to import and analyze data from your Dynamics 365 Customer Insights service. The connector can be found under the Online Services category in the Get Data dialog. 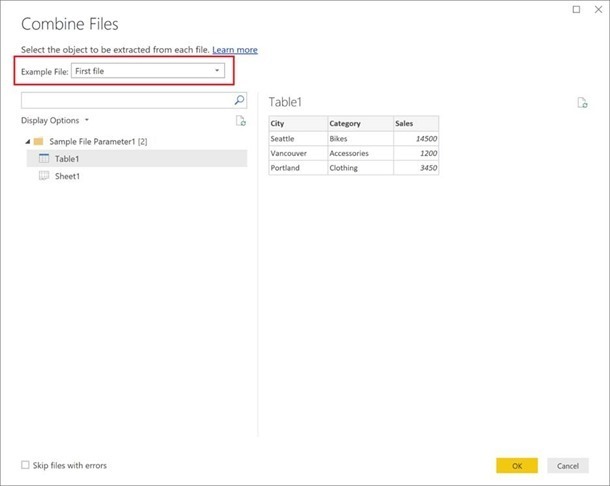 This month we’re improving the Combine Files experience by allowing you to always reference the “first file” in a folder as the example file. Before this update, you had to pick a specific file by name, which might cause errors in the future if the file is removed from the folder. With this month’s update, you can select “First File” in the Combine Files dialog, which will ensure that the first file in the folder is used as the example, regardless of the specific file name. We are adding two new data transformations to the Query editor this month. A common request is being able to extract all text before, after or between delimiters from a Text column. Based on this feedback, these new options have been added to the Transform and Add Column tabs in the Query Editor ribbon, under the “Extract” dropdown menu. 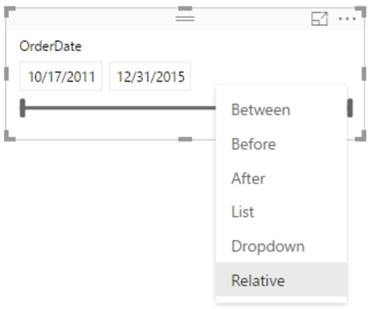 A new transform has been added under the “Unpivot Columns” menu that allows you to unpivot only the currently selected columns in the Query Editor preview. This will generate an explicit columns list in the current step so that the same set of columns is unpivoted on future refresh operations. Unpivot Other Columns: This operation provides the same capability as “Unpivot Columns” in terms of future behavior with respect to new columns appearing in the table. The main difference with “Unpivot Columns” is that it allows you to select that columns that should not be unpivoted. This case optimizes the user flow for cases where the number of columns that should not be unpivoted is much smaller than the number of columns that should be unpivoted, similarly to the behavior of “Remove Other Columns” compared to “Remove Columns”. And don’t forget to register for the 2017 Microsoft Data Insights Summit! I can’t wait to see everyone there.